In keeping peace or maintai-ning law and order the people or the general public have their part to play. Section 42 of the Criminal Procedure Code says that in the taking or preventing the escape of any person whom the Magistrate or police officer is authorised to arrest, every person is bound to assist the Magistrate or police officer, reasonably demanding his aid; in the prevention or suppression of a breach of peace or in the prevention of any injury to any railway or any public property, too, every person is similarly bound to assist a Magistrate or police officer, reasonably demanding his aid. It is to be noted that here the word written is “bound”; this means it is obligatory on the part of every person to help the Magistrate or police officer, reasonably demanding his aid. Section 77 says that when the immediate execution of any warrant is necessary and no police-officer is immediately available, any court other than a Metropolitan court may direct the execution of warrant to any person or persons and such person or persons “shall” execute the warrant. Section 78 says that a district Magistrate may within his district direct a warrant to any land-holder, farmer or manager of land for the arrest of any escaped convict, proclaimed offender or person (who has been accused of a non-bailable offence and who has eluded pursuit). Such land-holder, farmer or manager of land “shall” execute the warrant and arrest that convict or offender if that convict or offender is in his farm or enters his land. Here it is to be noted that in the last two sections the word “will” has not been used, and instead the word “shall” has been written which means that such execution of warrant and making the arrest is compulsory. On the other hand, section 43 says that when such a warrant is directed to any person other than a police officer, any other person may aid in the execution of warrant, if the person to whom the warrant is directed is near at hand and acting in the execution of the warrant. Section 44 says that every person aware of the commission or of the intention of any other person to commit any offence punishable under certain sections of the penal code, shall forthwith give information of such commission to the nearest Magistrate or police officer. It is to be noted that, in the absence of reasonable excuse, the person so aware, shall give that information. The burden of proof of his reasonable excuse shall lie upon that person, so aware. 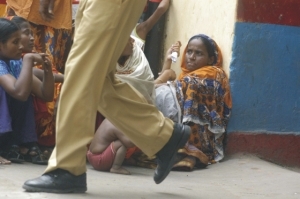 When some persons wage war or intend to wage war against Bangladesh, or plan sedition against Bangladesh Government, or armed with deadly weapons join or intend to join an unlawful assembly, or cause riot or intend to cause riot, or have committed murder or plan to commit murder, or have committed or prepared to commit robbery or dacoity, or set fire or plan to set fire to a house, or have committed or prepared for lurking house-trespass or house-breaking by night and some other persons have knowledge of the commission or intention of the commission of the offence, it is the duty of these other persons, so aware, to communicate the matter to the nearest Magistrate or police officer. The foregoing list of offences is not exhaustive; there are still some other offences; if some persons have knowledge of the commission or intention of the commission of the offences by some other persons, it becomes the responsibility of these persons, so aware, to report it to the nearest Magistrate or police officer. Section 161 says any police officer making an investigation (in cognisable cases) may examine orally any person supposed to be acquainted with the facts and circumstances of the case. Such person shall be bound to answer all questions, other than questions, answers to which would have a tendency to expose him to a criminal charge or to a penalty or forfeiture. Here too it is evident that a member of general public is to aid the police officer in investigation of cases (cognisable). All the above sections and some of other sections of the Criminal Procedure Code, show that any member of the general public has an important role to play or has some responsibility in keeping peace or maintaining law and order. Section 342: This section says that for the purpose of enabling the accused to explain any circumstances appearing in the evidence against him, the court may at any stage of any inquiry or trial put such questions to the accused as the court considers necessary, and shall, for the purpose aforesaid, question him generally on the case after the witnesses for the prosecution have been examined and before the accused is called for his defence. Now the magistrates can make better use of this section for the sake of making the trial better and perfect. The section very clearly says that at any stage of the enquiry or trial, any question regarding the statements of the witnesses of the prosecution may be put to the accused. If questions are put regarding the statements of the witnesses, and answers are obtained from the accused at every stage of the trial, when the trial is in progress, then circumstances of the case and the case itself are far better understood than when all the witnesses have been examined and all have made their statements, at the fag end of the examination of the witnesses. If during the examination of the witnesses, when the trial is in progress any question is put to the accused regarding any important or relevant statement of any witness, more light is thrown on the circumstances and facts of the case, and the case is far better understood. The magistrates, only on the conclusion of the examination of all the prosecution witnesses, examine the accused by simply asking him “Are you guilty of the offence or are you not guilty”? The accused generally answers, “not guilty.” Exhaustive explanation is not obtained by simply putting that question to the accused. Just as the examinations of the prosecution witnesses are exhaustive, elaborate and thorough, magistrates should better put relevant and pertinent questions to the accused just as and just when any important fact transpires as the examination of the witness progresses. The prosecution lawyer gets the opportunity of examining and cross-examining the witnesses. The court does not put any question to the accused or the witnesses. The court remains silent; the accused remains silent during the progress of the trial. If the court puts questions to accused at any stage of the trial, the magistrate gets more clues of the case; he understands in a better way the facts and circumstances of the case by asking the accused some questions in a direct way and by relating or linking the answers of the accused to the circumstances of the case. This he may do, as the trial progresses or at the end of the trial, when he writes the judgement. During the training period of the magistrates, and in the instructions at all other times, the magistrates are told to put a general question to the accused summarily at the fag end of the examination of the witnesses. The magistrates may make better and greater use of this section 342 and may acquaint ourselves with the facts and circumstances of the case right from the outset by putting any necessary or relevant questions to the accused. This section very clearly provides that. It may be noted here that in the trials under Islamic style or trials according to Islamic law or trials by quazis, questioning or asking the accused is not at all forbidden. There is one further point that may be discussed here. The purpose of this section appears to give better opportunity for the defence of the accused. But the court may put any question, relevant and important, to the accused which may both give the defence the opportunity of self-defence as well as the chance or possibility of incriminating the accused, if he is really guilty of the offence. The court may put questions whichever are relevant. We draw the kind attention of the government to the matter. The government may kindly consider to make necessary and relevant amendments to this section for conducting the trial in a better and perfect way. Section 540: The court may summon any person to examine him as a witness in any case, if the witness of that person seems essential to the just decision of the case. The court may examine any person as witness who is present in the court at the time of trial. The court may re-examine any person already examined as witness. Under the provision of this section magistrates may call by summons any person if his witness seems necessary to the conduct of the trial. But they (magistrates) should not unnecessarily call any person to the court to embarrass him. Section 386: The magistrates may for the recovery of fine (a) issue a warrant for the levy of the amount of fine by attachment and sale of any movable property belonging to the offender or (b) issue an warrant to the Collector of the District authorising him to realise the amount by civil process from the movable or immovable property or both, of the defaulter of fine. For every sentence of fine, we may take action of realising this fine. The offender very often does not pay the fine and does not feel the weight or bear the “brunt” of the judgement. By the ordinary way, his immovable properties are attached and sold out and the money of fine is realised. By the civil process, his movable properties as well as his land or house are also sold out for realising the fine. Now we may look at another aspect of Magistracy -- the welfare aspect. Section 545: The court may impose a fine in any sentence. Now that fine, the accused may pay of his own accord; otherwise this may e realised by the aforesaid methods. The court while passing judgement may be order that the whole or part of the fine so realised may be given to the prosecution side for defraying expenses properly or incurred for instituting or carrying on the prosecution. 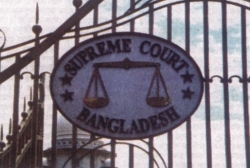 Also the court may, out of that fine, pay any 'compensation' for any loss or injury caused by the offence, when substantial 'compensation is, in the opinion of the court, recoverable by such person in a civil court.” Such payment of expenses or 'compensation' should not be made before the time of appeal has elapsed or the decision of the appeal is given, if the appeal is presented. By realising the fine and giving it as expenses of the suit or compensation for any loss or injury caused by the offence, substantial benefit is achieved to the complainant suffering such losses. This is a kind of social welfare and the magistrates may make greater or better use of this section. Minor offender: If a minor commits an offence and he is sentenced to imprisonment, the court may sentence him to detention in a reformatory or Borstal school for three to seven years. Section 562 (1): In certain cases and if certain conditions are fulfilled, the court may not sentence any person, above 21 years of age or any person, under 21 years of age, or any woman, for committing certain types of offence if the offence is committed for the first time. The court will consider the age, character and antecedents of the offender in the case; the court may release the offender on probation of good conduct and require him to enter into a bond to appear within a certain time to receive the sentence and during that time he should be of good conduct. Section 562 (1A): If a person is convicted of theft in a building, dishonest misappropriation, cheating or any offence for which the punishment is not more than two years' imprisonment, and if the person is first offender, the court may consider his age, character, antecedent, physical or mental conditions, the extenuating circumstances and the trivial nature of the offence, may, instead of passing any sentence against him, release him after admonition. These two sections too are touching the welfare aspect of the society and the social units or individuals. After reflecting on some provisions of the Criminal Procedure Code, we see, in what way the members of the general public can play their part in keeping peace, and maintaining law and order. We may also find how some sections may be used more for conducting trial in a better way. We may use some other sections in a greater way which contribute much to the welfare of the society. The author is a former First Class Magistrate.